Whether you are an ordained chaplain or just someone who loves people and has a kind, listening ear, becoming a Ship Visitor is a unique volunteer opportunity. Seafarers on cargo ships are key to our local economy. While they bring us our goods, they are isolated at sea for many months, away from family, and are very grateful to be greeted at our ports with a welcoming smile and a listening ear. Ship Visitor volunteers love the outdoors in all weather conditions, and must be willing to climb gangways and be comfortable with heights and with driving a passenger van in and around the Philadelphia area. A driver’s license is necessary, and the ability to use an “app” on a smart phone. We offer safety equipment, training, and assistance with obtaining the necessary TWIC (port entrance authorization) card. We are looking for volunteers who can commit to at least one weekday morning to early afternoon per month scheduled a month in advance, and welcome as many weekday shifts as you desire. We serve 30 terminals on both the Pennsylvania and South Jersey side of the Delaware River. If interested in learning more, please email hpierson@sciphiladelphia.org. Applications are continually accepted. SCI needs your help to gather items for Ditty Bags given to Seafarers during the holiday season. Learn more about Ditty Bags here. 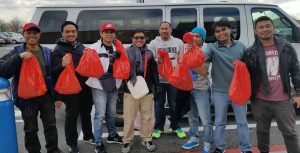 Help seafarers by knitting or crocheting warm hats and scarves in dark colors. Use your favorite pattern, or click here for suggestions. Please click here to contact us. We will be glad to talk about each of the opportunities described above as well as possibilities for groups. Interested in learning more about what we do? Sign up for our E-Newsletter!